Activity to support the future “EARTH” with each another, and send hope of tomorrow to friends. Calling messages out to support the future of the “EARTH” together with each heart, through the activity of contribution to the society, with organizations supporting. The picture books were donated and our original movies were shown at APRSAF. Astronaut Koichi Wakata sent us the spirit of “HEARTHEART” from the universe. Astronaut Akihiko Hoshide sent us the spirit of “HEARTHEART” from the universe. We invited the middle and high-school students of stricken area by Great East Japan earthquake to “ASEAN-Japan Music Festival”. 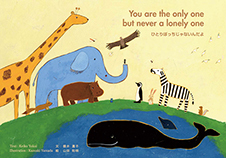 We handed over our picture books to people at “HAPPY DAY TOKYO 2014”. The picture books were donated to children who received a prize at “Asian International Children’s Film Festival”. Our original song “HEARTHEART” was sang in chorus and our picture books were donated at “The Music Train for The Borderless World”, the music event for children in Myanmar. International Futsal Friendly Match “HEARTHEART CUP” and workshops were held in Indonesia.